Jay Henderson told us in his recent interview that IBM would soon be building upon its Holiday Benchmark e-commerce trend analysis for the holiday shopping period with the addition of a “back-to-school” analysis. Alas, Rodney Daingerfield is no longer with us, but the IBM Benchmark can be your roommate this go ’round, the only analytics-based, peer-level benchmarking solution that measures online marketing results from the web sites of more than 500 leading U.S. retailers. July and August Online Sales: Overall sales for July increased more than 11 percent over July 2011 while August slowed with sales up 3.9 percent compared to last year. Social commerce: In July, shopper referrals to retailer sites from social networks generated 1.6 percent of all sales, an increase of 25.1 percent over last year. This trend continued in August reaching 1.8 percent, an increase of 69.7 percent over the previous year. Mobile commerce: Mobile commerce remains strong with sales from mobile devices reaching 15.7 percent in July and 15.4 percent over the month of August. Home goods: In July online sales grew by just over 30 percent and 25.5 percent in August with consumers shifting some back to school purchases toward the home. Over this period mobile sales also thrived, reaching 19.1 percent in July and topping out at 20.1 percent in August. Apparel stores: Online sales were up 9.2 percent in July and 9.8 percent in August. Over this period mobile sales reached 15.1 percent and 16.4 percent in August. Apparel stores also experienced strong social commerce with shoppers referred to their sites from social networks generating 1.4 percent of all sales in July and 2.2 percent in August, up more than 113 percent over 2011, more than any other industry. Office Supplies/Electronics: Online sales grew by 6.3 percent in July while dropping by .92 percent in August. Mobile sales reached 5.7 percent in July remained steady in August a 5.9 percent. Part of IBM’s Smarter Commerce initiative, the IBM Benchmark provides intelligence on how consumers are responding to the products and services being offered to them. With these insights CMOs and teams gain deeper insight into each customer which they can use to present personalized recommendations, promotions and other sales incentives across the wide variety of channels—including social networks and mobile devices. While U.S. consumers shopped this July and August, they were not buying clothes and notebooks for their children but rather items for the home. According to findings, the biggest retail gains this back to school shopping season came from home goods purchases which increased 30 percent in July and more than 25 percent in August over their respective months in 2012. While experts speculate that consumers were holding off on back to school purchases to eye the choices of their peers, social networks appeared to drive purchases with social sales increasing 69.7 percent. The social influence was especially apparent when it came to apparel, where shoppers referred to online stores through social networks generated a 2.2 percent of all sales in August, an increase of more than 113 percent over 2011. Mobile commerce also continued to grow with sales increasing 15.7 percent in July and 15.4 percent in August. For home goods mobile sales reached a high of 20.1 percent. The growing influence of both mobile and social media further validates the need for a Smarter Commerce approach that helps retailers attain, understand, and act — in real-time — on deep insights about their customers in order to meet the unique needs of each. “When I speak to executives at the leading companies, one of the discussions that continues to come up most frequently is around harnessing big data and their efforts to try and understand how to take all the noise and word of mouth that is being generated and make sense of it,” explained W. “RP” Raghupathi, Professor of Information Systems, School of Business, at Fordham University. Read this blog post from IBM’s Mike Rhodin (or better yet, watch the video interview we conducted with him in Madrid this past May) to learn more about “insight-driven” computing and IBM’s Smarter Commerce initiative. IBM senior vice president Mike Rhodin explains to the gathered audience in Madrid how the Smarter Commerce initiative was a logical and inevitable offshoot of IBM’s smarter planet campaign, one driven by the need for more insight- and action-driven analytics. Rhodin’s talk was entitled “Transform Your Business Around the Customer,” again with the central theme of the Summit that if more businesses wanted to keep theirs, they would increasingly have to pivot their business around customer needs. The change this movement would bring was startling. We saw the social media embraced in both the social, political, and, increasingly business realms, and we saw that the physical world was about to become digitized…to some degree, because of the crisis. Scott Laningham and I sat down with Mike Rhodin in the Smarter Commerce Global Summit Solutions Center just after his keynote in Madrid here this morning to discuss the evolution of the Smarter Commerce initiative, and the opportunity it, and other emerging technologies such as IBM’s Watson, provide companies looking to become more analytics and data-driven. Ergo, the world, and organizations, needed to better understand systemic risk in advance of its rearing its ugly head. Hence, the need to instrument the world around us. In this age, business outcomes are increasingly insight-driven, solutions are more intelligent, and technology is designed to be more and more cognitive. “It’s not about understanding what happens, but rather, what you do about it, what actions you take,” Rhodin concluded. With this explosion of data from a hyper-connected society of empowered consumers, we “must extract insight from our most important assets – employees and customers – through smarter analytics,” and the challenge, then, is to address the need for “volume, velocity, and veracity” to help find the right data amidst all those needles amidst all those haystacks. And it’s a big series of haystacks and needles. The data generated between the dawn of civilization and 2003 is now created every two days! Rhodin explained. The shift being, of course, a continual transition whereby today’s analytics evolves into tomorrow’s cognitive computing capability, where Watson-style technologies utilizing natural language processing and hypothesis-generating and adaptation and learning systems virtually reinvent the IT future. “We can remake parts of industries that have been untouched by IT in the past,” Rhodin concluded. Our first interview at IBM Impact 2012 this year was with IBM senior vice president, IBM Software Solutions Group, Mike Rhodin. This was also our first ever opportunity to interview Mike, so we were especially excited about this particular interview. Mike leads an organization which focuses on delivering integrated offerings that target high-growth opportunities, including business analytics, collaboration, and industry solutions. As a senior vice president, Mike is responsible for a $5 billion business portfolio which represents one of the fastest growing and most acquisitive. In our interview, Mike explained that his business is reaching more of a non-traditional technology buyer, the senior “line of business” executives who have played a much more dominant role in tech acquisition through the economic downturn, and who are looking for solutions that can help their organizations differentiate themselves in the marketplace, and and even more readily empower front-line executives and decision makers. He also brought us up to date on what IBM’s Watson has been up to over the past year, explaining that Watson finally got a “real” job — actually, a couple of them! In his former IBM lives, Mike has served as the general manager of IBM’s Northeast Europe organization, as well as the GM of IBM’s Lotus Software division, a stint in which he led a team to create the “human side” of IBM’s software strategy by developing IBM’s collaborative technology and solutions which integrate people, data, and business processes. Mike Rhodin explains to the IBM Forbes Business Leadership Forum at Impact 2012 Monday morning that the best companies moving forward will put the customer at the center of their every action. After this morning’s keynote session, I went promptly over to the Forbes Business Leadership Forum to listen for a bit to Mike Perlis, Forbes president and CEO, and Mike Rhodin, IBM’s senior vice president for our Software Solutions group. In the spirit of full disclosure, I’m a Forbes magazine subscriber — and apparently I’m hardly alone, even in this alleged age of digital media and publishing. In fact, Perlis took great pains to walk the gathered IBM Impact audience through the evolution of Forbes magazine and its transition into the digital era, as a kind of case study into how one unique traditional media publishing property didn’t succumb to the whims of history. Perlis outlined some key objectives for Forbes, including keeping its print business on track as it built its digital business, and also by developing its brand extensions and becoming a great technology company. These days, Forbes has some 100 freelancers, 100 staff editors and reporters, and over 300 posts per day on Forbes.com, the centerpiece of Forbes digital strategy. But Forbes has also embraced the social media in a huge way, with an aggressive presence on all the major social media properties, including Facebook, Twitter, and LinkedIn. 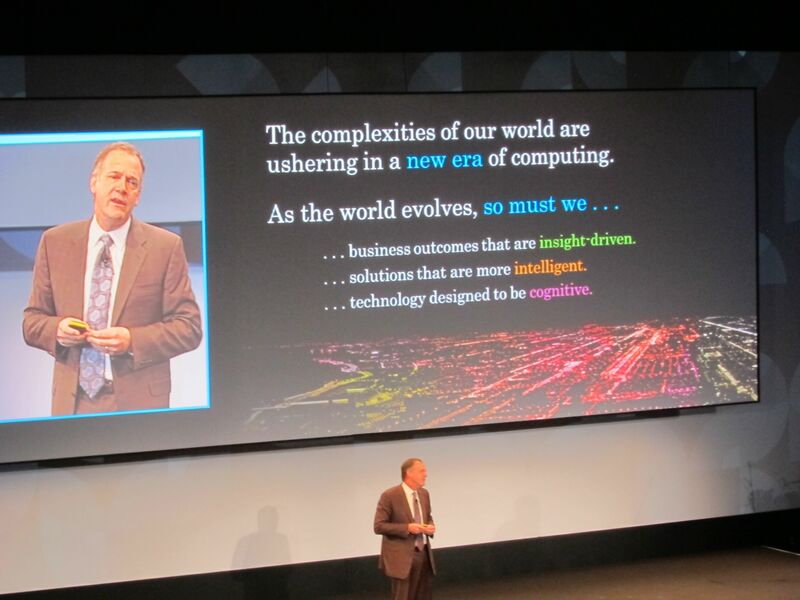 Perlis then handed the reins over to IBM senior vice president, Mike Rhodin, who leads our Software Solutions business. Rhodin went on to cite some examples of the staggering amounts of data that must be dealt with: That there are 340 million Tweets now per day, that 80% of the new data growth are in images, videos and documents, that there are 5 million trading events occurring every second! Such astronomical figures are creating some tough new challenges, not only for IT but for the mainstream of a business. Forty-five percent of CFOs see a need to improve data integration and risk management, Rhodin explained, and 73 percent of CMOs see a need to invest in technology to manage new big data. Business leaders aren’t just concerned with what product to buy, Rhodin explained, but are focused on garnering better business outcomes, how to improve the efficiency of their online marketing campaigns, how to improve cash flows…business problems needing business solutions enabled by technology. Rhodin also explained that business leaders need to learn to think differently (a theme brought up time and again in Walter Isaacson’s keynote this morning) about analytics, explaining that a new pattern of automation is emerging that is being driven by the instrumentation of the world around us. “This has become a 24/7 feedback loop where sellers and marketers constantly change roles,” Rhodin concluded, and those who put the consumer at the center of every action would be the new information age’s ultimate victors. Greetings, Lotuspherians…and those beyond who wish they were here. After a night of Tweetups and parties and bar talk and heaven only knows what other tidings going on in here in Orlando, it was time to awaken early and get your social business vitamin shot. IBMs’ Mike Rhodin and Jon Iwata delivered early and often in their opening remarks on Day 2. 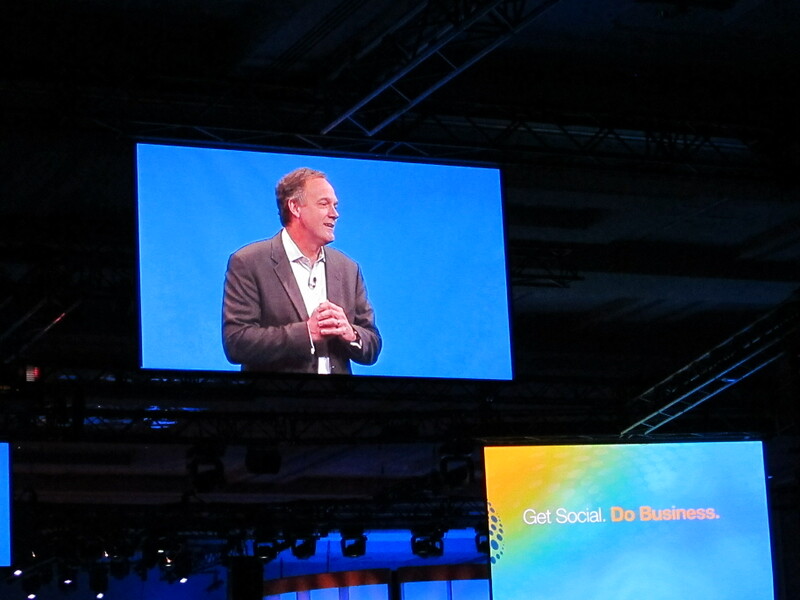 IBM's Mike Rhodin explains the challenges and opportunities of social business for the Lotusphere 2011 audience in Orlando, Florida. Rhodin is Vice President, IBM Industry Solutions, and picked up on a theme he started to deliver in the marketplace at last fall’s IBM Industry Summit in Barcelona. With a nod to Alister Rennie’s comments from Day 1, he acknowledged that the market is shifting to a new era of social business, and that we heard yesterday from a wide variety of clients about the obstacles and opportunities. And, more importantly, noted Rhodin, we heard from one another, our fellows in business and industry about the steps we’re taking to build smarter, more social businesses. Rhodin then encapsulated the challenges and opportunities. The challenges: Information overload (15 petabytes per day and growing), shared complexity (both infrastructure and organizational), and the need to create more shared connections. The opportunity? Social businesses embrace networks of people to create business value, and there are a few key entry points: The need to deepen client relationships, to drive operational efficiencies, and to optimize the workforce. We’ve all had to focus on getting leaner and meaner these past few years, to the first point. But we can also get new products to market faster, and use the market as a listening and sounding board more effectively. Most key to social business, we can optimize our workforce by finding ways to extract new value from an increasingly distributed workforce (think globalization), and to do so without impacting productivity (in fact, quite the opposite) and to help our people become more focused on innovation. Rhodin then posed some provocative questions: What are consumers saying about your business? Are you listening? What about your employee’s digital reputations, which have never been more important? Did you know 20% of the top search engine queries in the world were now going back to consumer generated content? Is your organization applying social analytics practices to conduct sophisticated sentiment analysis that can help you understand not only your brand reputation but also help you improve your products? Then, Rhodin put up a slide that I thought told the entire story in one sweeping motion: The transition from traditional, hierarchical enterprises transitioning to social synergistic ones consisting of vast numbers of communities and a culture of sharing and innovation, which will soon start to separate the leaders from the masses. It was then that Rhodin introduced IBM senior vice president, Jon Iwata, whom I also had the pleasure to hear speak about IBM’s 100-year legacy last fall in Barcelona. Iwata provided another quick flashback, but this time to explain we’ve all been here before. It was 1995, and IBM bought Lotus as the commercialization of the Internet was underway and everyone in the market was talking about browsers and content. IBM, and then CEO Lou Gerstner, were talking about the potential impact on business, even though to many it appeared IBM had no real involvement with the Internet. Quite the contrary, and as IBM introduced the idea of “e-business,” it soon became clear Gerstner and others were correct, and the impact on business and organizations around the globe since then has been profound. And today, Iwata explained, we’ve got another opportunity to lead and to make a new market, and in the process to provide our companies with game-changing capabilities. With this strategy, we could start to see for the first time what was happening in key infrastucture: Our energy grids, our supply chains, etc., and we could make them more sustainable and, in a word, smarter. But, Iwata went on to explain we also saw all the ways people interact would also become smarter, from the interconnectedness using social software to the mobility new devices would bring. Now, we could connect billions of people, use social analytics to analyze all this new data (including our connections to one another! ), and tap into the core human reality that people are inherently social. Sometimes we work socially in a public way (retail), sometimes in a private, secure way (banking), but we’re all social. Hence, social business, like e-business, is an opportunity to transform the enterprise, the way we work, extract, and create value, and yes, the ways we interact with one another. IBM’s proof point, Iwata pointed out, was “Generation Open,” our own internal software development community that allows IBMers to develop software of their own choosing, and the reputation monitoring and feedback included to motivate and reward those developers. The results? Generation Open delivered 160,000 new projects last year, drove down development costs by one-third, and increased asset reuse by 4X. And that’s what IBM continues to deliver in its market communications: strong, tangible proof points of how social business can deliver real business outcomes. Take social engagement, for example: There is lots of focus on internal collaboration and expertise sharing, but what about when you go outside the firewall. You may want to designate certain teams to monitor the social media, or provide CRM. Realistically, Iwata suggested, all of our employees will soon adopt social technologies if they haven’t already. So, how can we help enable them? At IBM, we recently launched an enablement program, named aptly enough, “Social Business @ IBM,” which helps increase the social acumen of 400,000+ IBMers, educating them on policies and guidelines, and also enabling them with tools that allows them to monitor their personal networks, participate in key social media vehicles, and the like. 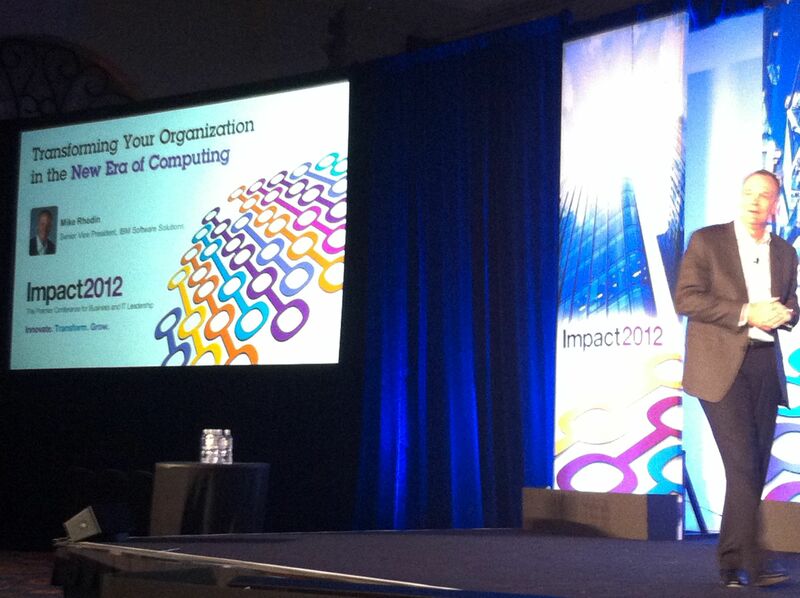 We expect to educate 50,000 IBMers by the end of this year alone, explained Iwata. This new type of change requires new systems of management and leadership. Traditional vertical functions (sales and marketing, HR, etc.) will require more integration, driven by transparency and the need to have a single view of the customer. Iwata began his close with a call to action: Those of you who are champions of social media will soon find yourselves becoming an integrating force in your organizations. Be prepared to help the organization make this disruptive transition, and concurrently, think about how you can leverage secure, scalable technology (including that from IBM) combined with tangible business outcomes and responsible management practices to successfully navigate your way to the new world. The time to act is now, concluded Iwata, and the way to act is together.